The equity market outlook often changes quickly, without warnings and sometimes for the worse. It’s rarely clear whether the market will bounce back to new highs after a correction. And of course, the first step of any bear market is a correction. Bear markets never show up with fanfare. They don’t tell you in advance that you should get out before showing up. Quite the opposite in fact as they usually happen when investors expect them the least! Much has been written about the value of diversified and balanced portfolios as they help weather bear markets while also producing reasonable gains over the long haul. Yet, for all their benefits, this approach taken alone also has important limitations. The chart on the right illustrates this point. The Vanguard Life Strategy Moderate Growth Fund (VSMGX) is a balanced portfolio made up of roughly 60% equities (US and international stocks) and 40% bonds. During the Financial Crisis, VSMGX suffered a decline of 41% from peak to trough, while the S&P 500 index ETF (SPY) lost over 55%. In other words, owning VSMGX instead of SPY reduced the impact of the worst decline by about 25%, which is a good thing. However, that is still a 41% decline, which is still very difficult to stomach for most investors. What’s worse is that most investors panic and tend to sell as they see their portfolio decline, thereby locking in the losses and essentially guaranteeing that they won’t make it back when the market turns around, out of fear of additional losses. This unfortunate reality is caused by what behavioral finance scientists call loss aversion. Above all, Columbus stays away from risks and uncertain markets. So when the stock market becomes turbulent or volatile, Columbus greatly reduces and may even completely eliminate its allocation to equities. This has proven a wise choice during both the Dotcom crash and the Financial Crisis as Columbus essentially got out of stocks at the onset of both market catastrophes. When and where market upside does exist, Columbus will attempt to capture this upside but only if the level of risk is acceptable. This allows Columbus to capture the equity market upside during bull markets while staying away from risks and dangerous markets. The chart on the left shows a blended portfolio made up of 50% Columbus and 50% VSMGX, our proxy used above for a balanced portfolio. We can see how adding Columbus to the mix boosted the overall long-term performance while also reducing the worst declines. 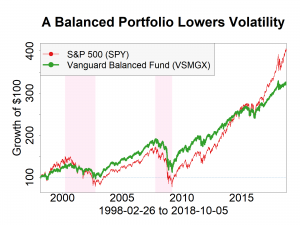 While VSMGX suffered a -41% decline during the Financial Crisis, the blended portfolio only lost 20.7%, a nearly 50% reduction in the overall balanced portfolio’s decline. From an investor behavior standpoint, this reduction is immensely helpful because a typical investor can usually stomach a 20% decline without panicking when they also see the overall stock market lose over 50% or more. In addition, the superior performance offered by Columbus boosted the long-term annual portfolio performance by 45%, from 5.5% annually (VSMGX) to 8% annually (Columbus/VSMGX blend). After considering the effect of inflation, this extra annual performance can make a very meaningful difference to the investor’s portfolio over the long run. 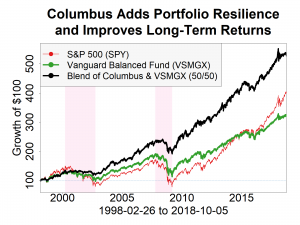 Although the example above illustrated a 50% blend of Columbus with a balanced portfolio (VSMGX), even introducing a smaller amount of Columbus active management can make a meaningful difference over the long haul. When uncertainty about the future is high, introducing some level of active management to an otherwise properly balanced portfolio makes a lot of sense. As you construct your client’s portfolios for an uncertain future, consider adding Columbus to the mix, then use it to actively manage risks and market turbulence going forward.